The most important function of the lungs is to take oxygen from the environment and transfer it to the bloodstream. They are involved in numerous other functions occurring in the body, including the acidity. Yet, it is a fact that they affect every single aspect of our health and bodies, considering the fact that we take over 6 million breaths annually. However, their proper function can be easily reduced as they can get polluted with toxins from our diet, the products we use, and the environment. Toxins that enter the lungs easily find their way in the bloodstream and cause severe health issues. “-Cigarette smoke is the #1 cause of lung cancer, with smokers accounting for 80% of all lung cancer diagnoses. Other lung conditions caused by cigarette smoke are COPD, emphysema, chronic bronchitis, pneumonia, and tuberculosis. The smoke from cigarettes causes the lungs to become irritated, creating mucus in excess. This can cause excessive coughing and difficulty breathing. This category consists of substances of a variety of different forms. Asbestos, at the top of the list, is a household carcinogen that can commonly be found in homes built before the 1980s within insulation, tiling, plaster, etc. -Outdoor Air Pollution- There are many types of air pollution, both natural and manmade, that we consume daily. Natural air pollution includes smoke from wildfires or ash from volcanoes. On the man-made side, the air is full of emissions that come from cars, planes, factories, etc. Other products like aerosol cans, pesticides and gas appliances can also contribute, on a smaller scale, to air pollution. 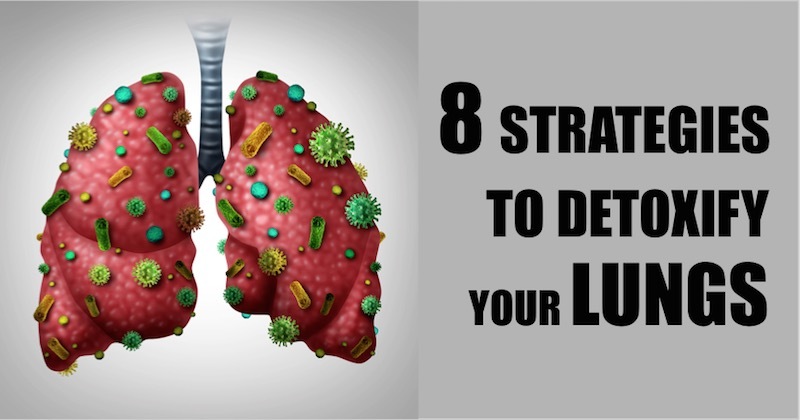 In order to boost the capacity of the lungs, improve the health of the respiratory tract, and lower the risk of lung cancer, you should detoxify the lungs in a natural way. This is the first step to cleansing the lungs. Protect your respiratory tract by quitting this harmful habit, and focus on healthy dietary and lifestyle choices. The tar in cigarettes is a cancer-causing agent, that leads to colds, coughs, wheezing, and lung cancer. The daily consumption of fresh grape juice cleanses the lungs from toxins and soothes inflammation, lowers the risk of lung cancer, and reduces the severity of asthma. Water improves health in countless ways, and it even improves the health of the lungs. By keeping them hydrated, you will clear mucus and prevent bacterial infections. You can also add half a lemon, 10 cucumber slices, and a handful of mint leaves to a jug of water, leave it overnight, and drink this potent detox drink during the day. Deep breathing cleanses the lungs from toxins, boosts the blood flow to the lungs, and increase the capacity of the lungs for filtering clean oxygen for the muscles. Lemon water acts as a diuretic and is one of the most powerful antioxidants and natural cleansers. Ginger and peppermint cleanse the lungs and unclog the respiratory tract, so make sure you drink a cup of peppermint and ginger tea before bed. The inhalation of steam while in the shower eliminates toxins from the lungs. Yet, if you hang eucalyptus in the shower room, which is a strong antiseptic and antioxidant, you will lower the risk of coughs and colds, soothe a sore throat or relieve congestion or clogged sinuses. Foods like soy, dairy, meat, and wheat lead to the accumulation of mucus in the lungs as they are hard to digest. On the other hand, focus on foods rich in antioxidants and fiber. As most of the products we use to clean the household and full of dangerous chemicals that harm our respiratory tract and entire body, try to replace them with natural ones, that contain no flammable ingredients or fragrances.